In a world where companies compete more and more on the basis of customer experience, understanding what those customers expect is essential. 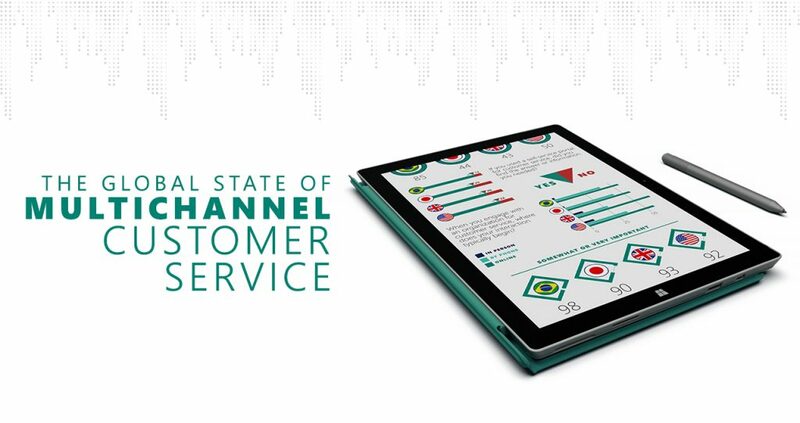 Microsoft surveyed 4 key global markets for the Global State of Multichannel Customer Service Report, which reveals the channels, habits, frustrations, and preferences of customers around the globe. The results are fascinating in that there are more commonalities than differences and that, online or offline, customers still want to engage. Customer expectations are changing and growing just as rapidly as the technology that customers use to engage. On average, 97 percent of global customers say customer service is a key differentiator in their decisions to use—or abandon—a company. Keeping customers satisfied is no small undertaking, though. Almost 60 percent of consumers said they have higher expectations for customer service now than they had a year ago. One thing’s for sure: across the board, customers around the world say their top priority is getting their issues resolved quickly, so that’s a definite place to start. To consumers, being able to find a resolution to an issue or an answer to a question on their own is increasingly important. Now, 90 percent of worldwide customers expect self-service. Unfortunately, even when self-service is available, roughly 1 in 5 individuals can’t find the information they need, which lowers customer satisfaction scores and forces these customers into higher-cost channels that they didn’t choose. There’s clearly a lot of room for improvement. It’s not just a place for rants and raves, though. More and more, customers are turning to social media for help. In the US and UK, 1 in 3 customers have used social media to ask a service question, and more than half of Brazilians have, too! Smart brands know social media channels are another way to track incoming service issues, build their brand, and offer unique experiences. Customers engage with organizations using whatever channels they feel offer the most value and satisfaction for their time spent. When asked what channel they use to reach organizations for customer service, customers revealed that they turn to the web for first contact. But they don’t stop there. Japanese customers use an average of 2 service channels to interact with brands, US and UK customers use an average of 4, and Brazilian customers use an average of 5! It’s vital, then, that brands offer the channels their customers prefer and are able to keep up with any customer-led channel switching. That means providing a seamless experience and smooth transitions between channels. Providing personalized and consistent engagement across all channels and devices—regardless of how the engagement began—will increase customer satisfaction and retention, particularly when customers continue to reveal their growing expectations for social, mobile, and self-service options. Which channel do global customers prefer to use? Ultimately, the Microsoft study is a powerful reminder that the customer is in control. Every interaction matters and could mean the difference between a fed-up customer and a loyal fan. Wherever business is done, in whichever corner of the world, customers not only deserve a company’s best efforts, they also expect it.